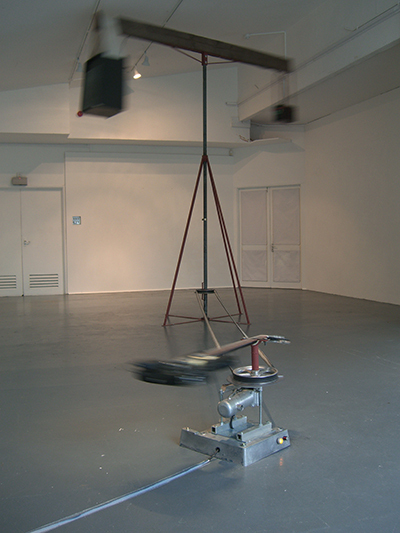 A single wheelchair motor slowly revolves both guitar and amplifier, creating a droning aeolian loop. The motion that produces the sound is one and the same motion which disperses it around the room. The guitar is simply placed within a kinetic system and allowed to resonate. The combination of doppler and leslie effects achieved by the movement of the speaker and the room's acoustics cause subtle shifts within the eternal chord. This work is part of the collection of Tomasz Wendland, curator of Mediations Biennale in Poznan, Poland. "Essentially a live rock concert in the guise of a kinetic sculptural installation; except that there's just one guitar, one chord and it doesn't seem to stop. This chord, produced by a spinning guitar, is played above our heads from a revolving amp, the sound continually changing in both its timbre and its microtonal structure through the Doppler effect and the reverberations off the walls of the gallery. There is nothing hidden yet something magical seems to be occurring as there is nothing visible making the guitar play. There is also nothing but air between our heads and a very heavy amplifier spinning above. Sound is clearly a physical experience." "Spatially, rhythmically and sonically mesmerising, Air Guitar encourages an immersive slowing down. As a meditative machine with neither beginning nor end - all is 'in the middle' - it repays those who linger. It sharpens perception and amplifies imaginative connectivity, triggering a density and complexity of associations far greater than the sum of its parts. The libidinous energy of the guitar, its arc tracing a blurred memory of the whirl of Pete Townsend's arm. Then the patience and pathos of the wheelchair motor, doing something, working steadily but going nowhere. A frayed belt drives the shaft at the axis of a T-shaped metal & wood structure that's somehow reminiscent of an outback water pump, or of a Sufi whirling dervish, spinning palms raised. Finally, the slightly daunting momentum of the counter-balanced speaker & battery through the air; the centrifugal sonic space generated is curtailed and bounced back by the gallery walls. This is a work of ambiguous and resonant couplings: of the home-made and the sophisticated; dynamic movement and stasis; closed circuit and opened sonic space; gravitied weight and the illusion of circling flight; the material and the immaterial, in particular absent bodies and their ghostly presences - the guitar's (and the wheelchair's) intimate congruence with the human body"